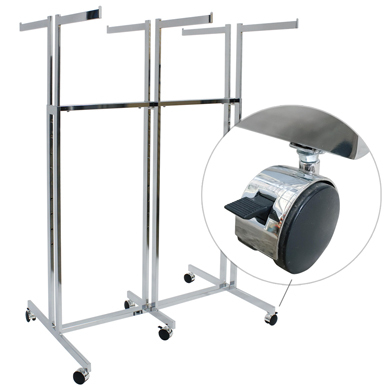 High Capacity 6 Way Garment Rack is perfect for displaying a variety of clothes and accessories. This retail clothing rack has 6 straight 24 in. arms that can be independently adjusted every 3 in. from 48 in. to 72 in. Each arm is 20 in. apart to fit most standard size hangers. Rectangular tube base and arms. Includes chrome hooded casters, 3 locking and 3 non locking.